Late night art: flower fantasy – Go ask Alisa – DIY capsule wardrobe one stitch at a time! Around a month ago I have sent my significant other (and it’s complicated now) a parcel. Amongst art canvas, that I have worked on for our house, I have sent an empty one, with only background painted and a note, saying that I can’t seem to find any inspiration to continue painting. I felt devastated and I suddenly understood that being in the dark place is not that scary as being in the place, where you don’t want to create, where you stop being driven towards your passions. That is what really should scare people – not loosing someone, but loosing yourself! P.S. : I think a better picture is needed, but since it is almost 11pm, no matter how many pictures I take, it is not going to be destined to turn out good. Will see tomorrow, with the daylight! 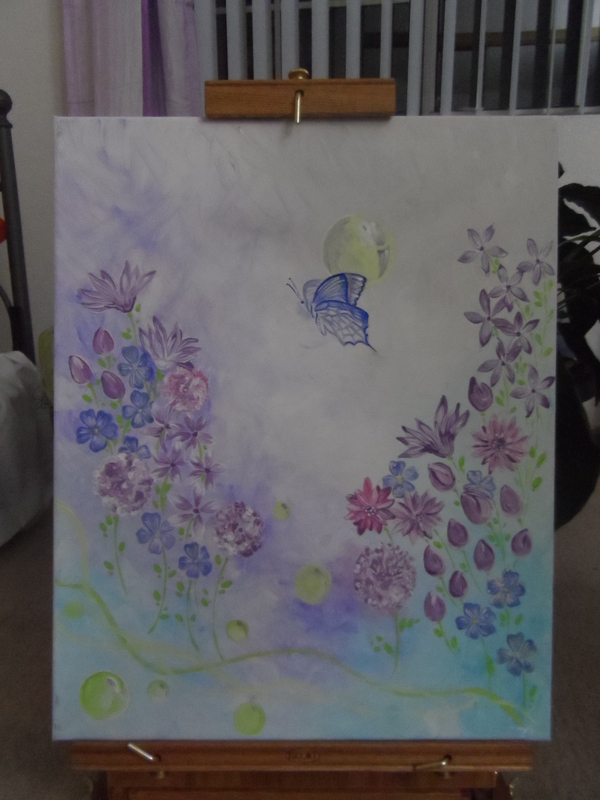 This is a beautiful painting… I especially love the butterfly’s wings! Great job. It is terrible to lose yourself…so glad you’re aware enough to not leave your passion to create beautiful art behind. I especially love the butterfly at the heart of the painting. Butterflies always remind me of transformation, transition, and growing of the soul. Surrounded by the beautiful flowers, it really does symbolize elegance and freedom, bravery and tenderness. Nice!!! Thank you for your wonderful comment, means a lot to me! And… at the beginning of every beautiful art creation must stand love to yourself. But not that kind of love that spoils you and makes you a bitter, self-centered, offensive and rude person, no… That kind of love to yourself that makes you realize how happy you are and share this love with others!